The NSW Government has issued an intergenerational report that projects growth, demographics and social trends 40 years ahead to 2056. The 40-year span represents one generation, and when we look back 40 years we can see just how much change has occurred. The ageing population is a good example, particularly when matched to the working population. In 1976, there were a healthy seven workers earning taxes for every person over 65; in 2016 there are only four workers per retiree, and the projection for 2056 is that there will only be 2.4 workers supporting each retiree over 65 years old. Essentially, the next generation will have a large number of older people requiring massive funds to prop up the health system for the aged. In 1976, the percentage of the state population over 65 was 9.1 per cent. It is currently 15.6 per cent, but by 2056, 24.2 per cent of the population is expected to be over 65. In short, a quarter of the population will be older people, generally requiring more health support. The current annual state cost of health is $64.5 billion, which is 29 per cent of all state expenses, but by 2056 the health spend will rise to $543 billion or 36 per cent of state expenses according to the report. Due to this dramatic jump in health costs, state budgets will need to cut back on other expenditures to keep the health system going. The intergenerational report indicated that with no cutbacks, there would be a fiscal gap of $17 billion in 2056 but there will be a lower proportion of workers to fund the taxation and levies that will be needed. My guess is that state governments will move out of more and more services that have traditionally been undertaken by the public sector and this will include infrastructure and public transport. The cities will need to minimise low density development that requires new infrastructure and shift more to higher density development that supports public transport patronage. People will live longer, with the current 1,500 NSW people aged over 100 lifting to 18,000 centerarians by 2056. Compare this to 40 years ago, when there were only 100 people in the state aged 100 and over. The state population will jump from 7.6 million people to 11.2 million by 2056 with most of this growth in the Sydney metropolitan area. The annual population growth comes from net migration of around 41,000 people coming to NSW, natural population increase of around 45,000 and the ageing population, with people living longer. The median age in 1976 was 29 and is currently 37. By 2056, the median age in NSW will be 41. Average real income per capita is currently $67,000, but by 2056 this will have risen to $116,000. NSW general capital expenditure is projected to rise from $3 billion in 2014-15 to $23 billion in 2055-56 in net terms. 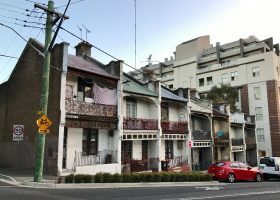 Housing supply has been a problem in NSW for some time with low levels from 2006 to 2012. During those years, the state average was only 29,500 compared to the average of 42,500 over the previous 20 years. The report outlines the state projection of 45,000 housing completions a year up to 2031. It then goes on to argue that an extra 10,000 dwellings a year would reduce housing price growth in the near term, leading to improvements in affordability. The graph below outlines the housing completions from 1986 to 2015. Another significant issue affecting planners and property developers is the changing job market. Manufacturing has declined greatly from 1976, from 20 per cent to seven per cent of the workforce. The service sector accounts for nearly all new jobs created since the mid-to-late 1960s. Occupations such as engineers, accountants, and IT professionals have grown. Determining the key industries of the future is quite hard as rapid and unpredictable advances in technology have disrupted many industries. The workplace is expected to become increasingly flexible. In particular, the CSIRO points to rapid growth in freelance consulting as employees seek to take advantage of a constantly changing job market. Businesses will increasingly outsource to experts. Many different workers will embrace working from home or co-working facilities with other contractors. Telecommuting and remote working will become increasingly acceptable as technological advances in communication will enhance this. Planners will need to look towards facilitating ‘workplace hubs’ which will allow freelances to rent space as needed. The NSW Intergenerational Report is an eye-opener in terms of the changes that have occurred over the last 40 years and those expected over the next 40 years. The report can be accessed here.